I’m over in sunny San Francisco right now and as usual, things in America are just a bit different. 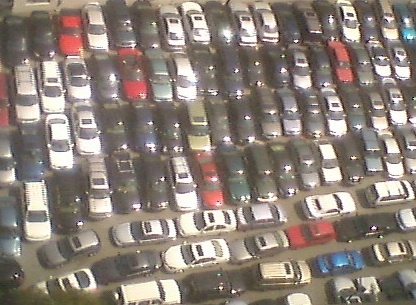 This is the view of the local parking lot from the office of our PR company – busy huh? Can you imagine the epiphany someone must have had when they realised "you don’t have to allow every car to leave at any time"?! Wow. Suddenly you’ve got two, maybe three times the revenue coming from the same piece of land you own already. Happy day! Relevance for Zopa? Well, Zopa (at least partially) came out of something of an epiphany moment ("What if you could buy and sell money on eBay?") so we recognise the value of them. More so is something about just breaking with accepted limitations and conventional thinking ("The parking lot is full" vs. "What do you mean? The parking lot is half empty!") – and that’s something we think we’re quite good at. Zopa is about challenging conventions around how money works, how financial services work and what people can achieve by getting together and doing stuff. What conventions do you think we need to take on?